This blog brings you new perspectives and interesting ideas in cycling, without any charge. You may pay me back through your continued interest. Some months back while visiting a good friend of mine, I happened to grab a vintage cycling book off his shelf and flip across its pages. I like the smell of old books. Its like battery acid for the mind of a book enthusiast, just stimulating. In one of its uneventful pages simply titled Appendix, I came across the following words. Read carefully, as the author comes across as completely assured of what he's about to theorize. I'll tell you who wrote this at the end of the quote. "If you been riding long enough to have some falls, I'll bet that almost every injury has been on the left side of your body. How do I know this? Because its the same for me and many other riders. If you want to find an old bike racer, look for a guy with scars on his left elbow. There seems to be a physiological reason for this and it is very interesting, though it hasn't been formally documented as far as I know. It has to do with the location of the heart, the body's primary organ. As we know, the heart is to the left of the center in the chest. When the body loses equilibrium, it has a strong tendency to fall toward the heart side. This also explains why most riders find it easier to corner to the left than to the right. And it's why track races go counterclockwise so that all turning is to the left. The reason it feels more natural is that the distance from the heart to the ground is less when turning left than when turning right. 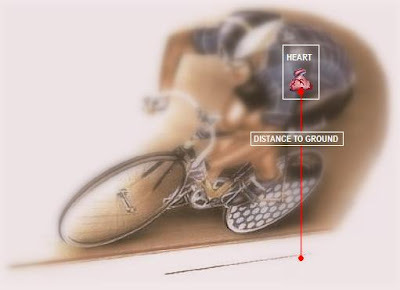 Even though track riders often do fall on their right side, this doesn't disprove the theory. It just points out the bike's tendency to slide down the banking. What is the practical value of all this? For one thing it means you may need more practice cornering to the right before it feels as natural as cornering to the left. It may also be wise to wear a protective pad on your left elbow in criteriums, especially if you've injured it before. Should you crash there is a better than even chance you'll land on it again. Keep this "left side" theory in mind and you may find other ways to use it for your benefit. " The author of those words, documented in the 1985 classic Bicycle Road Racing, was none other than the Polish coach, Eddie B (also known as the father of modern American cycling). Being one of the most respected coaches in history, you'd think he'd make sense with his ideas. This one is particularly interesting as he's stating that "almost every" injury is to the left side of the body because the body (if you consider it to be an inverted pendulum while on a bike) has a directional falling bias. It is also stated that because this "falling" is easier to the left than the right, cornering towards the left side is as well. Therefore, velodromes are run anticlockwise. So today's question : Is there biologically any reason behind the supposed tendencies to fall towards the left side, or is it just a subconscious reflex action to protect your derailleur and chainring from getting damaged? Ah. Think about that one for the weekend. This is motivating me to go out there on the track and analyze my energy expenditure riding both ways. If one direction is more difficult than the other, it might also mean I'm consuming more energy to do it. Good question! I think most of us are right dominated. We can unclip our right legs off from the pedal more easily in perceived danger, atleast I can. Perhaps the un-weighing of the right pedal has something to do with shifting equilibrium towards the left. I agree that handedness/footedness needs to be addressed. I feel like more people are right-dominant, as the second commenter mentions. It might be the ability to keep from falling right as he/she suggests, but it might be more primal than that. It's possible that evolutionarily, we're wired to protect our dominant side as much as possible. I'd guess that a caveman who had to throw a spear wrong-handed was less likely to survive than one who injured their other side in a fall. Then there is always the fall back of the Coriolis effect. :) Maybe the author has a northern hemisphere bias in his experience. What about riders in Brazil, Australia, etc? Do they tend to fall right? what about the drivetrain of the bike being on the right side? how does that affect balance and/or turning? I think the talk of clipping out is baloney. I am right-handed but I clip out with my left foot. When I played soccer as a kid I used to kick with my left foot too. It's what feels natural. What about the fact that roads are crowned? That would mean that old american and european bike racers would have scars on their left - but old british/australian/japanese riders would have scars on their *right*. Eddie B was not the only author of that book. Ed Pavelka was the co-author. Any way to find out who exactly gave the theory? At the moment the ring finger on my left hand has been injured in a fall three weeks ago and my left leg has more cuts and scars that I can count. I don't know if there is a science behind this but to me, it sort of makes sense. The heart is the hub of blood pumping so if its beating fast and is offcenter to the body, seems to me like more weight of blood is concentrated on the left side. Don't hold me responsible for that. Thanks for the post cozy...I've been watching for it! I don't know about the heart theory. I had a collision a month ago and damaged my right shoulder because I was turning away from the impact. On top of that I am right handed and unclip my left foot. Personally I think I am more comfortable on hard left turns cycling (and skiing) because I am right dominant. Perhaps its having my better hand/foot on the outside as I lean inside a turn. not conscious of the heart as a critical organ unless it is giving trouble. loop--blood will flow around this loop whether you are standing up, hanging up-side-down, or floating in zero gravity in space. I personally think we fall to the left to protect the right middle finger, which is frequently needed as a signaling device during moments of stress. If the "greatest cycling coach" can write nonsense like this, what about the lesser ones. This is one reason I don't buy guru books off the shelf. I'm left-handed, kick with my left foot, jump off with my left foot, smell better with my left nostril (crazy but true), see better with my left eye (even crazier but true), and hear better with my left ear... And always seem to instinctively twist my body around when I fall, so that I fall on my RIGHT side. I have a theory that it's a subconscious reaction that my body has to protect my 'good' (i.e., left) side from injury. Needless to say, most of my major scars are on the right side of my body, because of this. From both riding and martial arts experience, I have to support the "protect the dominant right side" theory. My first instinct is always to face my left side to danger. Most of my scars happen to be on the left side. I always attributed this to the fact that all crit courses that I've raced on turn counterclockwise (probably to keep consistent with velodromes?). Most of my crashes that warrant scars have been on crit corners. I live in Australia BTW. When I lived in Canada I was more into mountain biking. However most of my falls were still on the left. I always tried to fall on the left if I ever had a choice about it because it could potentially save my derailleur. Great post Ron. I'm continuously impressed by the interesting material you come up with! Didn't Eddie B also say cyclists should not drink much water on the bike? Great coaches don't necessarily have to be rational in every thing. I just found your blog. As a 4th year mech E student I really enjoy your perspective and writing style. Keep it up! Stuff about falling to the left is rubbish BUT I do prefer to corner to the left. The comment about old racers and scared left elbows is very true for me, looking at mine. Most of my worst injuries have been to my left side, but I'm not going to subscribe to any theory why...it just seems to be that way for me.